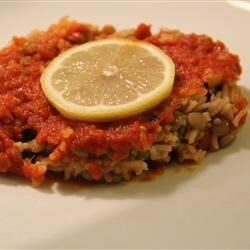 "Lentils, rice and pasta are cooked and then served in a spicy tomato sauce. This is a typical Egyptian dish that is very good and cheap over here! Puree the sauce in a food processor if you like a smoother texture." I liked this, but I think I liked it better than everyone else. It was a little bland, so I added a little here and there to spruce it up. Had it with naan, and it was good! great recipe. Instead of mixing everything up, I layered (more traditional that way). Really browned the onions and added cumin to the rice/lentil mixture.